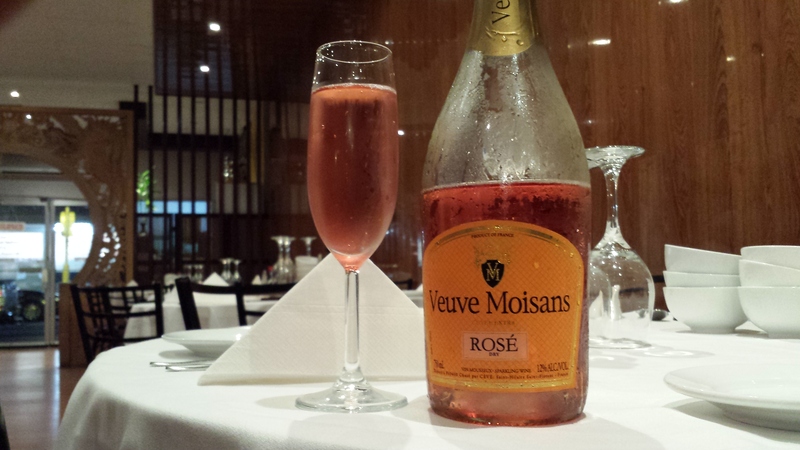 Veuve Moisans Rosé is a blend of Chardonnay, Sauvignon Blanc and Chenin Blanc. It is a crisp and fresh sparkling wine with nuances of sweetness. After an initial burst of berry sweetness on the entry, the wine quickly dries on the palate – find notes of tart raspberry, strawberry, pineapple, sliced yellow peach and grape skins before a finish of pomegranate. Veuve Moisans Rosé is a nicely balanced sparkling wine that seems to err to the drier side, after an initial shimmer of sweetness as soon as it hits the tongue. It matches beautifully with a raspberry cheesecake or grilled seafood. This entry was posted in Uncategorized and tagged Raspberry cheesecake, sparkling wine, Veuve Moisans Rosé. Bookmark the permalink.